Watch the trailer for Cold Pursuit and you could be forgiven for thinking, “Do we need another geri-actioner starring Liam Neeson on a roaring rampage of revenge?” Sure, it was fun and exhilarating in Taken, seeing Oskar Schindler crack skulls – after a career of gravel-throated gravitas, it represented one of the biggest star-rebrands since another mature actor with a similar-sounding name boarded Airplane! to leave grounded drama behind. But we’ve since had Taken 2 and Taken 3, Non-Stop, Run All Night, and The Commuter. The gimmick is beaten to a pulp, lifeless. Only Cold Pursuit is as much Point Blank-meets-Fargo as Liam’s latest trip to Hollywood Gym N Guns. And while it’s nowhere near as good as either John Boorman’s flinty revenge-thriller or the Coens’ black-humour-on-white-landscapes crime-com, it’s certainly better than its common-denominator trailer, off-the-peg title and hand-me-down premise would have you believe. We meet taciturn snowplough driver Nels Coxman (Neeson) as he’s named Citizen of the Year in Kehoe, a small ski-town nestled at the foot of the Rocky Mountains, nearest city Denver. Nels’ speech makes a joke of how he’s chosen one road in life – “I’m just a guy who keeps a strip of civilisation open through the wilderness” – but he’ll soon be veering into unknown territory when his twentysomething son, Kyle (Micheál Richardson), is found dead of a heroin overdose. “We didn’t know our son,” quivers Grace Coxman (Laura Dern), to which her granite-faced hubby growls, “Kyle was not a druggie.” And so naturally, Nels sets about pummelling faces until each split set of lips spits forth the next name on the chain of command, at which point he kills his prey, rolls them in chicken wire, and dumps them into an icy gorge. Why? Because it allows the fish to nip at the cadaver, meaning there’s no gas-bloated body to bob to the surface. Nels knows this because he read it in a crime novel. It’s humour like this, grisly, deadpan, that sets Cold Pursuit apart from Neeson’s other action-thrillers. As crafted by Norwegian director Hans Petter Moland, who here remakes his Stellan Skarsgård-starring thriller In Order of Disappearance with amplified laughs, it arrives smothered in a distinctly Scandinavian sensibility as surely as its unforgiving landscapes are smothered in snow. It is, as much as anything, a farce, introducing a host of flamboyant support players – a pair of cops, a band of Native-American drug dealers, a New York hitman named The Eskimo – as a parka-wearing Nels ices a slew of crims with nicknames such as Speedo, Limbo, and Santa. 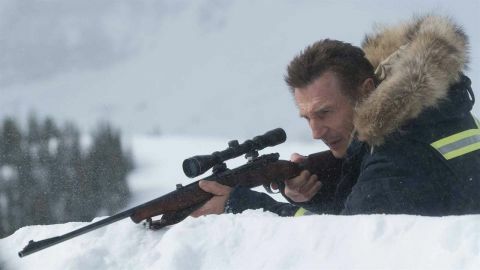 Nobody, it seems, has a Scooby as to who’s killing whom or why, and Moland escalates the bedlam not with frantic editing – Cold Pursuit moves forward with the implacable intent of a snowplough shifting a heavy night’s fall – but with absurd visual and aural flourishes. Nels wipes blood from his face and sinks a large knife into a packet of cocaine as The Pretenders’ 2000 Miles plays on the soundtrack (“The children will sing/He’ll be back at Christmas time”). Nels and The Eskimo drive straight-faced towards their destiny as Aqua’s Barbie Girl shrieks from the stereo. A vehicular chase unlike anything attempted by Ethan Hunt sees Nels’ snowplough churn after a carefully piloted Jeep at 30mph. And one bad guy is turned red when he’s blasted into a rack of wedding gowns in a pastel-hued bridal shop, while another lands on an inflatable sofa that slowly collapses. Also striking is the fun Moland has contrasting the hazardous terrain of the Rockies with the nightspots of Denver, as lonely red taillights blinking in swirling snow give way to writhing bodies drenched in strobing neon. Similarly, the action alternates between the forbidding exteriors and immaculate outposts – chic chateaus, polished log cabins and the spacious modernist abode occupied by drug kingpin Viking (Tom Bateman). At one point, during a nasty interrogation scene, black stallions gallop past the plate-glassed window in arch slow-motion. Not everything in Cold Pursuit works. Some jokes strain too hard, while Laura Dern is criminally wasted in just a couple of nondescript scenes. Most perplexing of all, Neeson goes missing for sizeable spells in the film’s second half, squeezed offscreen by a gallery of rogues who are at least colourful enough to keep you entertained in his absence. But this is a rare remake of worth – droll, sleek and not content to settle for being Taken 4.